Chromatic exercises help develop strength in all the fingers. I remember when I first started getting into shred, my first milestone was when I practiced chromatic exercises for about 8 hours straight one weekend. The improvement was quickly noticeable. Before then I just couldn’t play the chromatic riff to Master of Puppets by Metallica at any sort of quick speed with alternate picking. Afterwards, it felt so much easier and I found I could do it straight away! My favourite chromatic exercises are the ones which work with 4 notes per string, going up the strings from the bass to treble strings (E to e) and back down again. I do them at the first fret, then second, up to the 12th fret. This also develops stamina, and this little variation helps stop you getting bored. One thing to note with these exercises; make sure you aim for accuracy before speed. If you teach your hands to remember them incorrectly, that’s how you will always play them, and it becomes much harder when you’ll have to re-learn them. Start of at an easy speed, and gradually increase the metronome until you think you’ve reached your limit. Turn it down a few b.p.m, and stay at that speed until it becomes really easy for you. Repeat that method again and again and you should increase speed quite well. I mostly use these patterns whilst practicing or warming up, but feel free to vary the patterns to challenge yourself. 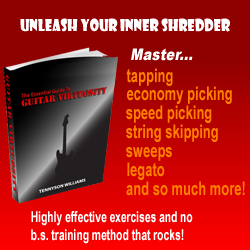 10 Guitar Speed Training Exercises That No Guitar Player Should Be Without! yeah bro just go up/down/up/down!